So, we were glancing some more at the interesting Planyc 2030 documents and website when we noticed that one of the more prominent empty parcels of land in Gowanus is serving as a poster child of sorts for brownfield sites. 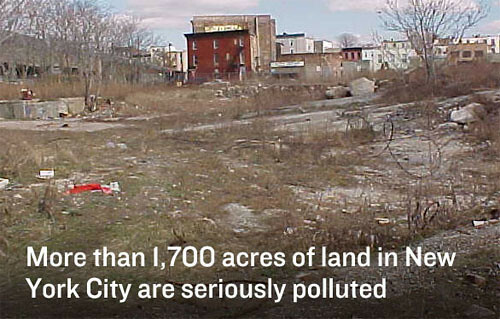 The 6.5 acre site was once used by Brooklyn Union Gas (Keyspan's corporate predecessor) to produce manufactured gas and is so polluted that no one is even sure what toxic hazards are beneath the soil. If you can't place the site, it's that big empty lot as the F and G train tracks loop into (or out of) the tunnel the Carroll Street station. Some NYU Wagner school students offered a redevelopment plan for the parcel earlier this year and created a Public Place website with photos and maps and details. The Gowanus Canal Community Development Corp.'s comprehensive plan--envisions recreational use for part of the parcel. The site may not be a threat only to itself. Last year, the Brooklyn Papers reports, Keyspan engineers detected the potent carcinogen benzene in groundwater under the site moving toward the hipper part of Smith Street, which is not the only nasty underground threat in the area. Environmental testing is still going on. You're such a hypocrite! You decry the existence of brownfields, but then you endlessly criticize Whole Foods for trying to redeem one of them. Why is progress so slow on this brownfield? From what I've read, Keyspan is liable for the mess. I've never seen any activity there, and I find it hard to believe that the tests take years to compelte. Who's getting paid off here to look the other way? I've lived a block from this site for nearly 8 years. Never have I seen anything done to it or testing etc. I again with anon 11:02 - someone's looking the other way.